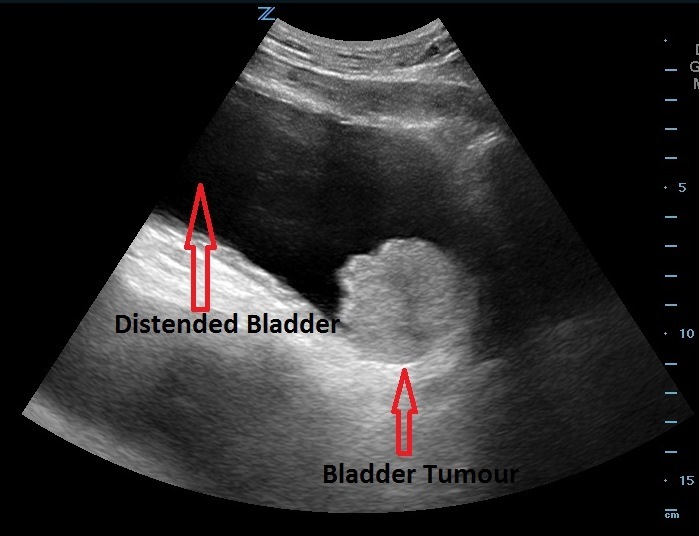 Lloyd’s Corner: POCUS makes things so easy, even the patient’s spouse can make the diagnosis! A 32 year-old man presented to the ED with vague and occasional symptoms of urinary discomfort and mild hematuria for 4 months. He had been given multiple courses of antibiotics. The history was otherwise unremarkable. Physical exam was completely negative. The patient looked fine. What to do? Plan A: Urinary testing and another course of antibiotics and referral back to the walk-in clinic and the same GPs. The wife immediately said: “That shouldn’t be there! It took about 10 seconds for the wife to make the proper diagnosis. This would likely have been visible on POCUS at the start of symptoms. « Scanning the adnexa…a no-go zone?